Venue: Stade de France Date: Saturday, 7 February Kick-off: 17:00 GMT Coverage: Watch live on BBC One, BBC One HD, online, tablets, mobiles and BBC Sport app from 1630 GMT; listen on BBC Radio 5 Live; text commentary on BBC Sport website. Two interviews with Ross Ford, one before the autumn internationals in November and the other on Thursday, in a quiet room at Murrayfield next door to where Vern Cotter was talking about the team he had just picked to play France. The Ford of November spoke about how his pride has been hurting pretty much for the entirety of his 11 years in the heart of the Scotland front row. He said that the team's inability to put wins on the board had driven him round the twist throughout his 77 caps, which is now 80 and soon to be 81. "We see bits in games during our analysis and it drives us crazy sometimes," he said. "We play really good stuff and have sides in all sorts of trouble but then we don't build on it. We shoot ourselves in the foot. "People see the final scoreline and after a while some of them forget about the little moments that were critical, the tiny mistakes we made at the wrong time that cost us. We live with those moments. "People see the end product and they get frustrated because we're not winning enough and they're absolutely right, but they don't see the hard work that goes into it behind the scenes and how frustrating it is for us players." In the weeks that followed those angst-ridden lines, Scotland beat Argentina and Tonga and ran New Zealand closer than they'd done in decades. With new players and a fresh energy they performed with elan and accuracy. They created things and scored tries. On Thursday, Ford looked back on the autumn with a sense that something meaningful is building at long last. You point to a picture of Vern Cotter on a press release and he smiles. "A really good coach," he says. An intimidating presence, perhaps? "You know he never raises his voice," Ford explains. "He's not lost it with anybody yet. "He doesn't shout and roar because he doesn't have to. He just starts speaking to us in his normal voice and everybody shuts up immediately because you want to hear every word he's saying. He's really, really good for us." The progress of the autumn is undeniable, but the real stuff begins now. If the Six Nations is all about momentum, as they say it is, then Scotland have had previous little of it this time of year and a trip to Paris, where they haven't won in 16 years, doesn't appear to offer much hope of getting it this season either. Ford is of a different mind, saying: "Yeah, I've not had many winning starts and it's a massive key to doing well. "The first game is so important. To be honest, I think we've done well to get France first up. I'm quite confident. "We've trained well and everything is going in the right direction. The French haven't had much time together and maybe they're not as close as they might be. "Everybody is talking about what the atmosphere is going to be like in the stadium on the back of the Charlie Hebdo attacks. The emotion is something that will unite the nation. The place will be bouncing even more than usual, but that just makes it even more fun. "The French team, if you can get on top of them and make them doubt themselves, the crowd will turn on them. The crowd will turn if we can front up and dominate them. "Two years ago, we were dominating them in the first half and causing them a lot of trouble and the crowd were just beginning to turn, but just after half-time they came back at us and the crowd got back on side. You have to do it for the full 80 minutes." Anything is possible ahead of the first game of the Six Nations. How many times have we been here before? The hope followed by the bitter reality. "It's the first time in a while that we're going into the championship on the back of causing teams trouble in the autumn," explains Ford. "We're carrying more threat. We had threats in certain areas of the pitch before but now it's all over the pitch. The young boys are coming through and it's great to have that energy around you. They have no baggage. That's for the old fellas. "They've never been involved in the failures and their enthusiasm rubs off. You look at Finn [Russell]. He'll have a go and sometimes it won't come off but it's nothing he worries about. "The young boys have raw talent and they're having fun with it. We come up against good players but this is a very together group and we're playing a style of heads-up rugby that suits us." It will, of course, be savagely hard, but then Ford wouldn't want it any other way. He talks about the psychology of rugby and compares the mindset of a winning team and a losing team. It's the game within the game and he loves it. "France have not had the greatest success over the last few years, so if we can get in their faces we can cause them trouble," he insists. "It's tough out there, but you can enjoy it, definitely. When you're on top of a team, it's amazing the buzz you get off that. You take in the opposition's body language. "When you're under pressure these things go by the wayside because you're worrying about other stuff. You're trying to get this sorted and that sorted. But if you get on top of a team and dominate them, it's the best feeling. "You feed off it and you can turn it back on them. You talk to them. "At line-outs, say, you tell them what they're going to do. You can see it coming. 'Right, this is what's going to happen. It's coming out the back door.' You call it before they call it. You get inside their heads. They start worrying about things and they can't enjoy themselves. "That psychology thing is good fun, when you're the team doing it." Ford is the first to say that it hasn't happened that way nearly as often he would have liked. 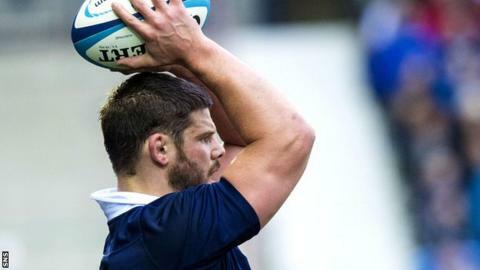 In the last eight years he has missed only two of Scotland's Six Nations matches, so he, more than anybody in this team, bears the mental scars of their dreadful record. "I'm hopeful we can change that this season," he adds. "I don't know if we're going to win in Paris, but we're not going over there to make up the numbers."